Another great trailer that premiered this weekend with the release of the Dark Knight was that of the upcoming Watchmen Movie trailer. We at FH were already looking forward to the Alan Moore adapted graphic novel that inspired the film, but the new trailer (especially with the Smashing Pumpkins soundtrack) has added a whole new level of excitement. And for those that may not have noticed it, that Smashing Pumpkins song (The Beginning is the End is the Beginning) was ironically made originally for that very forgettable Batman and Robin movie from a few years back. Check out the official movie website for more information and a higher resolution trailer download. And check back at FH for the latest news! 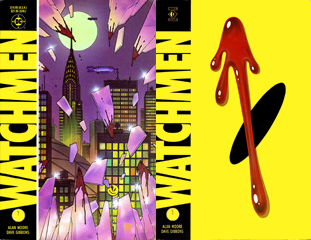 For those of you that are fans of Alan Moore and his successful comic book and film adaptations (V for Vendetta, From Hell), you’ll be pleased to know that Warner Brothers studios are scheduled to release a feature length film of Watchmen in March of 2009. Not much yet on the official movie site, but we at Favorite Hero will be sure to keep you updated as soon as more info is available. Thanks for the link Cava. You are currently browsing the archives for the Watchmen category.